Didn't realize how much I was prepared for disappointment until I opened the mailbox, saw the letter, and involuntarily danced up the driveway. Ethan and I danced around the house for a solid minute before I even got down to opening the thing. The handwriting on the envelope, written in pencil, is a perfectly drawn uppercase in neat rows, without slant or inclination. Diagonals strike through the zeros, the eights composed of two small, individual circles, one stacked atop the other. 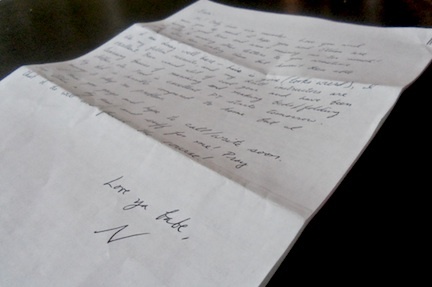 The letter itself is in Noah's familiar, jagged cursive. Written on the back of the official correspondence regarding his address and graduation, Noah's letter was hardly a page in length—He opened with, "I only have six minutes..." He's doing well, likes his fellow shipmates and instructors, informed me of the sad news that his ridiculously lustrous and thick hair is in fact gone (sob! ), and that his bed is horrible compared to home but he manages to sleep. He also said he's been writing letters but was unable to send them as of that date, which was October 6. His graduation will be November 23, the day before Thanksgiving. As soon as I could possibly corral Ethan and get him into the car, we were off to pick up a few photos I'd printed and buy an envelope big enough for twelve letters, four photos, and a couple of Ethan's drawings. Now it's my mantel and not my mailbox that's letter free. yay for the letter! i don't know what it is about a handwritten letter, but it salves the nerves like nothing else at times like these. Nellie—I know, right!? Best day. Thank you so much for thinking of us. I'm genuinely touched. magnolia—preach! I feel like Abigail Adams except with better healthcare.